This easy Baked Coconut Shrimp with Pineapple Dipping Sauce is healthy crispy shrimp with a cool pineapple and lime sauce with some jalapeno for a little kick. If you’re looking for a healthy recipe, these Baked Coconut Shrimp with Pineapple Dipping Sauce are just that. We had a lot of fun with our friends that were visiting. We shared a lot of good food, a lot of old memories, AND…a violent stomach bug that rocked us all to our core. It slowly made its way through our families and after bragging about my solid immune system, I was hit with it today. So I don’t feel much like cooking, eating, or even looking at food (that doesn’t happen often). Thankfully before I was hit with it, I posted this Baked Coconut Shrimp with Pineapple Dipping Sauce over at Tablespoon today. I saw on the news today that Florida is the only state that does not have snow in it. So for those of you shivering in the snow, this recipe will make you feel like you are on an island somewhere, lying in the warm sun, snuggling your toes in the hot sand. Although these coconut shrimp can be enjoyed as an appetizer, I often turn it into a meal by adding a simple green salad. Don’t feel too guilty eating these as your main course; they’re baked and a much healthier alternative to the fried version. Combine lime juice, jalapeno pepper, and pineapple preserves in a small bowl and mix well. Cover and refrigerate until ready to serve. Preheat oven to 400 degrees and line a cookie sheet with parchment paper. In a small bowl beat egg whites with a hand mixer until soft peaks form. Place cornstarch and coconut on two separate plates. 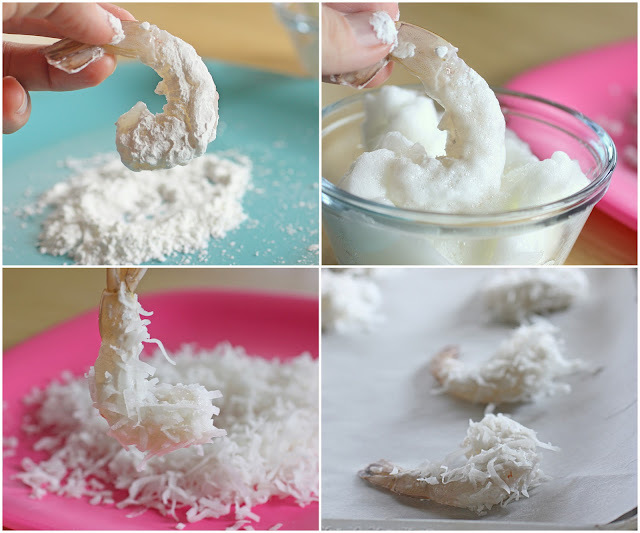 Hold shrimp by the tail and dip and coat the shrimp with cornstarch. Next, dip the shrimp in the egg whites and finally in the coconut coating well. 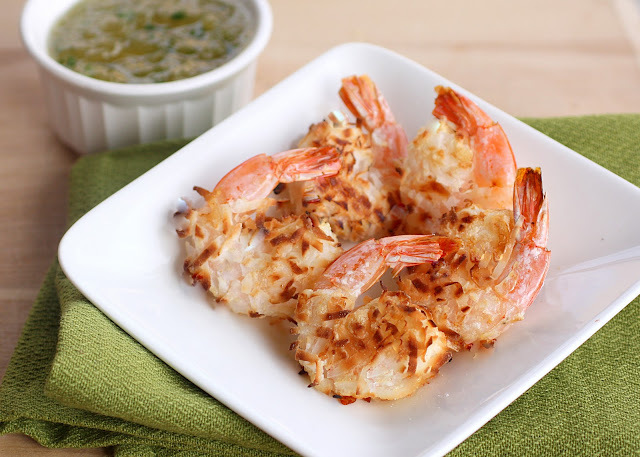 Place shrimp on the cookie sheet and bake for 15-17 minutes or until coconut is a golden brown. Make sure to turn it once halfway through (around 8 minutes into cooking time) to make sure both sides brown. Serve with pineapple dipping sauce. I really want to make this! Looks so good! I love this idea- the combination of pineapple and nutty coconut is classic and reminiscent of my fave tropical drink. Looks great but where’s the recipe? The link is right below the picture. I posted this over at Tablespoon. these do look great, but can they be eaten cold? having a romantic dinner before a concert in Atlanta and looking for things to transport that dont have to be hot to be enjoyed. These definitely should be eaten hot so I’m not sure if they are the best idea for the occasion. What if the shrimp is already Cooke? Can it still be baked? Unfortunately I feel like if you baked the already cooked shrimp it would turn rubbery. Made these tonight. We loved them..thank you. And easy.. Excellent! We loved it! I am going to try the breading on chicken strips next time! I made some pineapple- jalepeno salsa so we could alternate between the sweet and sweet/spicey bites! I love this recipe, and another GREAT sauce to use is Orange Marmalade Jelly with Tobasco Hot Sauce mixed into it. Sweet and Hot. Mix to your taste. I add a qtr tsp at a time. if you heat it up and serve with the hot shrimp. it is Awesome. ENJOY.. This was sooooo good! Super easy and better than I could have imagined!